Raederle: Can a raw vegan avoid nuts? If I have a nut allergy, can I eat a raw food diet? Can a raw vegan avoid nuts? If I have a nut allergy, can I eat a raw food diet? The short answer is, "Yes!" In fact, I encourage all raw vegans to eat very few to no nuts. Eating too many nuts can actually be very toxic and cause nut allergies. There are a number of things to be wary of with shelled nuts. Several of my books limit or do not include nuts. This is because most raw recipe books have nuts in nearly every recipe. In fact, I've bought a recipe book that called for a whole cup of nuts in the majority of the recipes. Generally cashews, which you will not find raw at the grocery store. “Raw Cashews” at your local market only means “not roasted.” Cashews are boiled out of their shell. They must be hand-cracked to be raw. One cup of oranges is fine – ten cups of oranges is fine. Ten cups of spinach, lettuce, cilantro, kiwis, kale, cucumber or apples – completely okay and healthy. Ten cups of nuts, however, would leave you curled up on the floor holding your stomach. If you consume two cups of nuts in a single day during your transition to raw veganism, that's fine. It's undoubtedly still an improvement from the old diet. However, over time, eating more than a couple handfuls in a day is very wearisome for the digestive system – and sometimes painful. Typical peanuts, in particular, should be completely avoided. They are virtually 100% guaranteed to contain aflatoxin (a waste product from mold). This especially is a problem for folks with Candida Overgrowth. Raw seeds, coconuts, avocados, raw olives (hard to find), durians (really hard to find) and fruits with some fat content (pomegranates, cucumbers), are excellent fat sources when avoiding nuts. Make sure not to over-do any fatty foods however; fatty foods take a long time to digest. I am not suggesting you stop eating nuts forever. I am just aiming to show that a raw vegan diet can be healthy and enjoyable without nuts. They are not required as a source of protein or fat. That is why my very first recipe book was Nut-Free Raw Recipes. 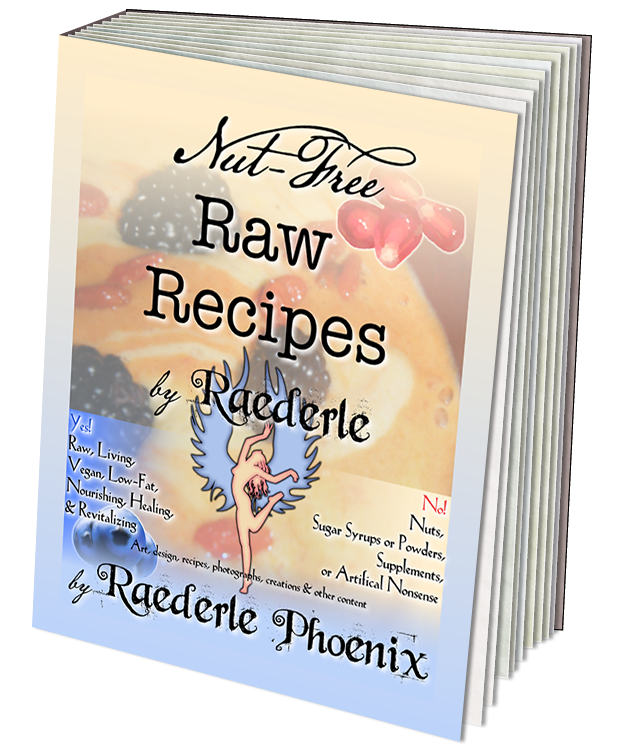 I had found that I felt better without nuts in my raw diet and I now share the recipes I used to get away from nuts with you. You don't need nuts for protein. The best source of protein is amino acids. Amino acids are in raw vegetables, and they are particularly high in sprouts (including bean sprouts and sprouted nuts). The other form of protein is chains of amino acids, called proteins, which are bio-available in raw seeds, raw nuts, bean sprouts and grain sprouts. There is detailed information and videos about protein, here on my website. It is unlikely that you'll eat too little fat by abstaining from nuts, even on a raw diet. By eating two tablespoons of seeds daily, it can be ensured that you'll get enough fat. Chia seeds, sesame seeds, pumpkin seeds and sunflower seeds are recommended. I do not advise more than a tablespoon of flax seeds daily. I definitely discourage buying pre-ground seeds which can be rancid when purchased. You can grind your own seeds in a coffee grinder, spice grinder, food processor or vitamix. Many raw vegans get enough fat and enough protein without consuming any nuts, seeds, avocados, durians or olives. 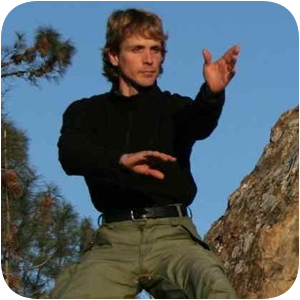 Tim Van Orden, a marathon runner, only eats raw fruits and vegetables. The main issue with nuts in long-term consumption is toxins that tend to be present in the nuts. They are stored for long periods of time and they oxidize and go rancid. Unfortunately, you almost never get fresh macadamia nuts in America. My Australian friends tell me that macadamia nuts here taste rancid to them because they are used to the fresh ones they can get in Australia. If nuts are consumed, it should be in moderation (I suggest one nut per day in my food pyramid), and they should be stored in the freezer. For fatty dressings, sesame seeds may be used. For interesting puddings, chia seeds may be used. Almost any seeds will make great raw pizza crusts in the dehydrator. For desserts, soaked oat groats may be used in the crusts, or chia seeds. Flax oil may be used in some recipes that call for almond oil. It is completely possible to fully avoid nuts and still enjoy a healthy raw vegan diet. The other reason why I discourage nuts is because of the allergy epidemic with nuts. I don't want people to think that a raw diet requires nuts and thereby think people with an allergy to nuts should stay away from raw food. On the contrary, nut allergies often develop in people who especially need a detoxifying diet. Their body is saying loudly, "I can't handle the toxins in nuts!" which is all the more reason for a primarily raw diet. Have a nut allergy? Want to minimuze nuts? Trying to reduce calories from fat? This meal plan is for you! Includes Lettuce Bruschetta Boats, Sunny Tomato Noodles, Lemon Ginger Porridge, Flavor-Explosion Muffins (shown on the cover), Spiced Cream Salad and many other fantastic nut-free recipes. This 7-day meal plan is nutritionally complete, getting you all you need in thirty different nutrient categories, including Omega-3, Omega-6, Iron, Calcium and Zinc just to name a few. Nut allergies? 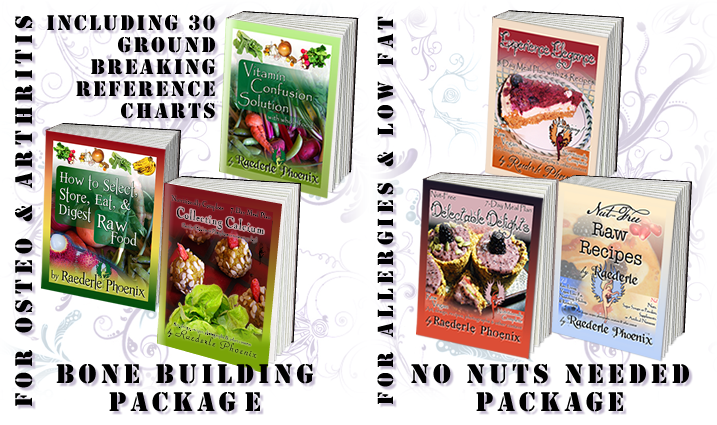 Want to enjoy gourmet raw treats without using two cups of nuts per recipe? This book brings together gourmet flavors, convenience and nut-free ingredients. And you don't need a dehydrator! 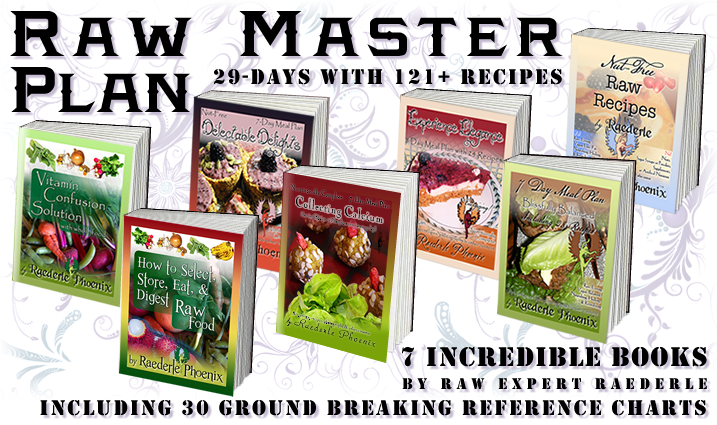 "Nut-Free Raw Recipes is great! I like how you explained the 'whys' and 'hows' of things, and the photos look yummy. One of my favorite parts are the quotes you include with each recipe." Last night I made Magnificent Minty Mango with hemp seeds and my husband and I LOVED it. Tonight I made Vanilla Cream Pie and we LOVED that too! Looking forward to doing more. 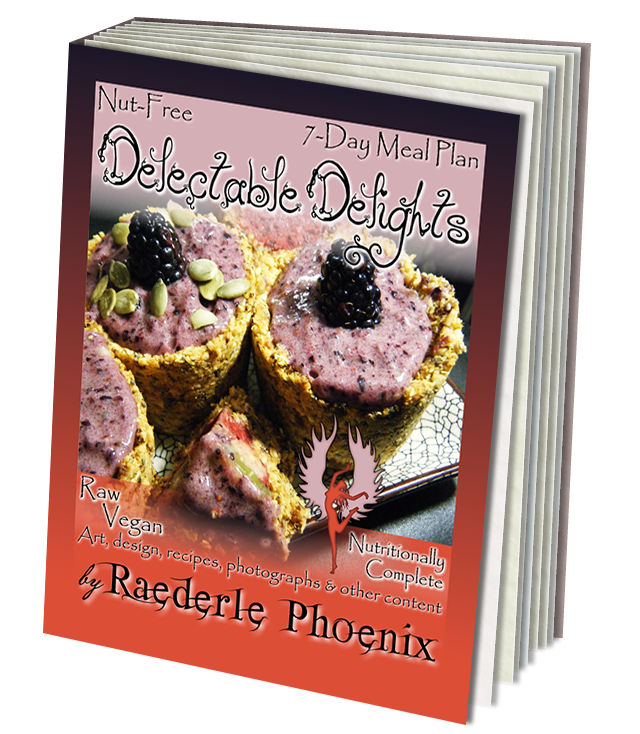 Raederle's recipe books are amazing, packed to the brim with delicious, mouthwatering dishes which as an added bonus are all amazingly healthy in every way possible. I've only been following the book for the last week yet I already feel healthier and my skin looks more radiant and glowing than ever before. Thanks Raederle! Thank you for all your amazing health and nutrition tips. You're amazing! 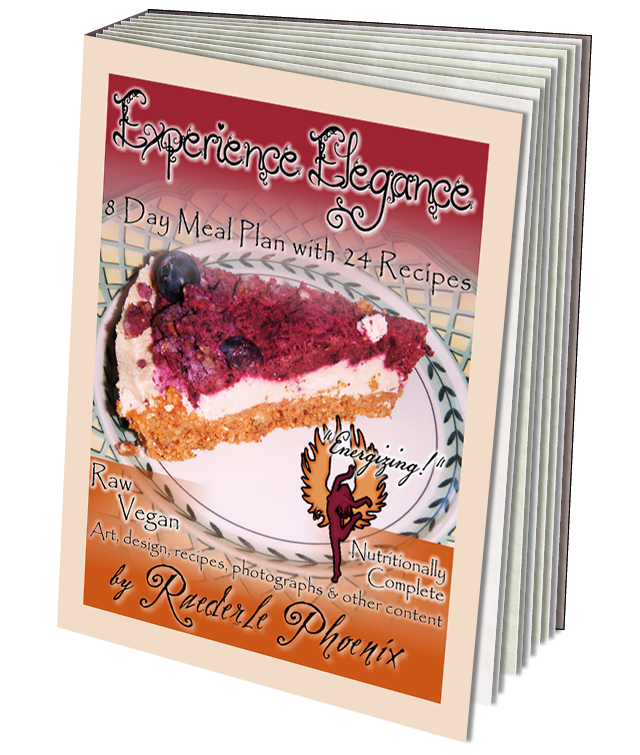 This 8-Day Nutritionally Complete Raw Vegan Meal Plan is ideal for raw foodies who want to minimize nuts and seeds most of the time, yet splurge once in a while. That's why this plan has eight days. The eighth day is "splurge day" (including raw cheesecake!) which I think we should all have once or twice a month. Your emotional health is just as vital as your physical health. The more physically healthy you are the easier it is to be emotionally healthy. I find that most of us feel more comforted and contented with our lives when we splurge on occasion, and contentment is emotional health. Includes dinners such as Creamy Cucumber Wraps; Lunches such as Raisin-Kale Muesli and Vanilla Fruit Medley; Breakfasts such as Chocolate Chia Pudding and Blackberry Carob Milk. Raederle's meals are honestly some of the most deliciously healthy meals I have ever enjoyed. 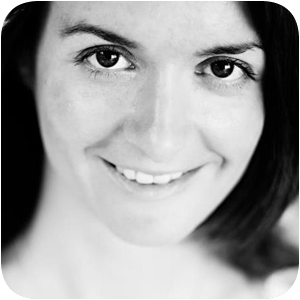 She is passionate in her work and has extensive knowledge. Her creations are immensely tasty and healthy. I highly recommend experiencing Raederle's love-inspired talents. If you're thinking, "Yes! An exact step-by-step plan is just what I need to get on the right track!" then look at purchase options below. If you buy them all together, you save over $200! That is a $63 savings! You will receive these via e-mail. That is a $46 savings! That is a $214 savings! All of these items are digital. You will receive them via e-mail. And, this package will not break your budget in groceries. There is minimal use of "superfood" powders and no use of expensive pre-packaged dehydrated snack-bars. Also, equipped with Vitamin Confusion Solution, you'll be able to select the healthiest whole foods to meet your specific needs on your budget. Have friends with allergies to nuts? Click here to return to the top and share on facebook, pinterest and twitter!